Can we get a report that lists all the devices that fail to check in with their location? After no more than 2 days would be sufficient i believe. Hey Darryl! We do not have such a report right now, but it sure sounds like a nice addition. I’ll raise that feature right away. For now, there’s something you can do. 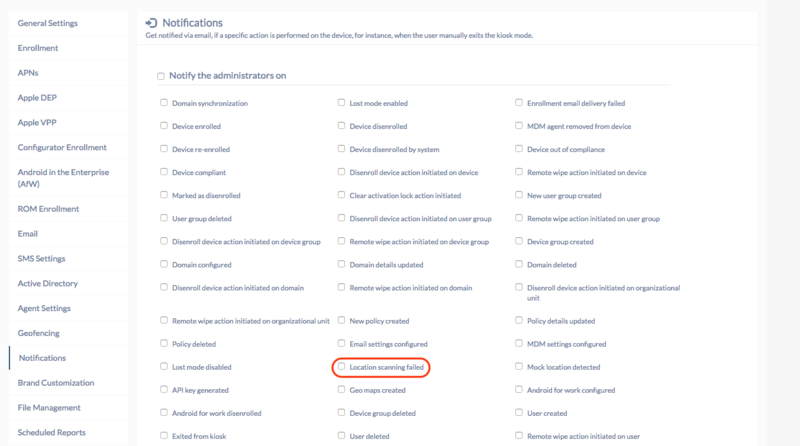 You can choose to receive email notifications when devices fail to report their location during location scans. Here’s how you can enable email notifications. 2. Click on Notifications tab located in the sidebar on the left side. 3. Click on the option Location scanning failed.